The Frugal Family Life: $.55/1 Sargento Cheese Coupon! Cheese coupons have been hard to come by lately! 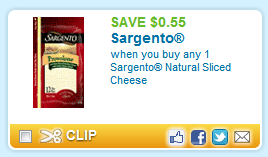 Here's a great $.55/1 Sargento Sliced Cheese Coupon for you! Use zipcode 36119 to find it quickly! This one will double to $1.10 off of ONE package at your stores that allow doubling! We can surely find a great deal with that!